Welcome to our website. For those of you we have yet to meet, we’d like to introduce ourselves, and share with you a bit of background on the company which has become Amphibians Plus. We are Harry and Cathy Shannon. 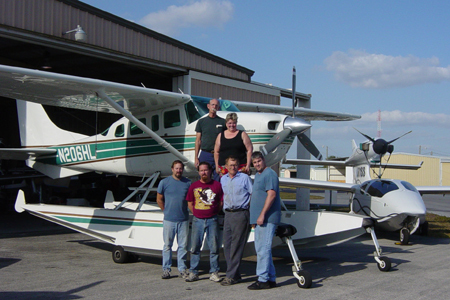 As far back as 1972 we combined forces to begin our first amphibian business, then known as Shannon Aircraft Inc. We were located in Louisiana. the major portion of our business involved maintaining aircraft which serviced the man oil rigs off the gulf coastal waters. In 1986 a career move as well as a change in locale brought the two of us to Lake Aircraft Inc., in Kissimmee Florida. Here… Harry became the service manager while Cathy filled positions first in the parts department, followed by accounting, as well as international marketing, then ultimately a position of assistant to the president. Always happiest working for ourselves, in 1992 we opened Amphibians Plus Inc. in Kissimmee Florida. In 1994 we relocated to our present location at Bartow Municipal Airport in Bartow, Florida. We believe the key to our success is a professional attitude, pride in our workmanship and ultimately the relationship with our customers. 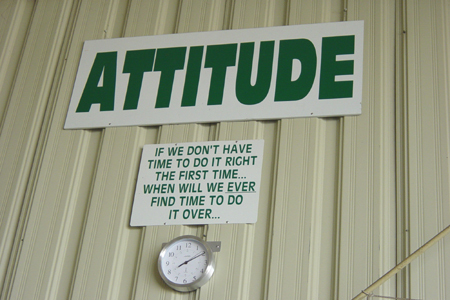 The following photo, still presenting itself in our workshop, summarizes our business ethics. Here at Amphibians Plus we have a great crew, let me introduce them to you. Top Row: Harry & Cathy Shannon.